It must be a struggle to not get back at the person who just fouled you on the pitch. The urge to catch your opponent with a sly blow or trip him is a tantalising temptation that players battle with every time they’re wronged. And it’s not just the physicality of the sport that raises tension among players. Comments from opponents can also rub the wrong way and lead them to take the law into their hands. Fortunately, there are rules in the game that deter such behaviour and referees and football governing bodies continue taking a strict view of altercations. Despite some pretty solid regulation in place, some players can’t help but take matters into their hands and mete out their own brand of justice. We start with football’s most recent case of vengeance. The Premier League fixture between Manchester United and Bournemouth this past Saturday was an important one for Mourinho and his men with the opportunity to finally move out of 6th place. The game started off as a spirited affair that saw United take the lead but soon descended into chaos when the Cherries drew level. Bournemouth captain Andrew Surman pushed Zlatan Ibrahimovic to the ground only to have his head trampled on by Tyrone Mings. Kevin Friend, the referee in charge saw the push but not Mings’ foul. The Swede, however, wasn’t about to let the matter go and elbowed Mings right in the face as they were cuing up for a set piece and the officials missed it again. 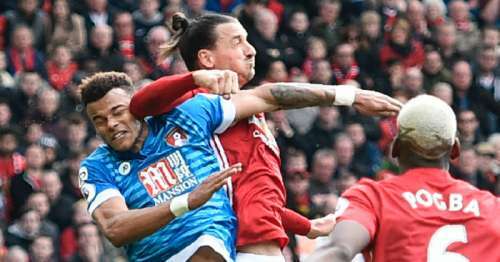 A pure case of revenge, Zlatan claimed Mings had simply jumped into his elbow and denied doing it on purpose while the Cherries defender claimed his infraction was also a mistake. Even though the match official failed to take action during the course of the game, the FA will be keen to hand out justice. The governing body has charged the former Inter forward with a three-match retrospective ban while Mings could face up to a six-game ban for his reckless action.